In order for the apps running on the same mobile device to be recognized as running on one device not on multiple devices by the Appeon License file, you will need to always input the same App ID for all apps and specify the same bundle identifier for the same app. For details, refer to the section called “Product Activation” in Appeon Server Configuration Guide for .NET or in Appeon Server Configuration Guide for J2EE. You would need to modify the App ID in the keychainaccessgroups.plist file and the Bundle Identifier in the Xcode project settings to match with what you have specified when creating the App ID (in Task 1.4: Create an App ID). Step 1: Find the keychainaccessgroups.plist file by expanding EonNativeApp > Supporting Files, as shown in the following figure. The keychainaccessgroups.plist file is in the same directory as the EonNativeApp.xcodeproc file. The key for the app in the keychainaccessgroups.plist file is made up of two parts: App ID + Bundle Identifier, in this format "AppID.BundleIdentifier", take 6DQU2XGFEE.com.appeon.mobile.1.0.2 for example, 6DQU2XGFEE is the App ID, com.appeon.mobile.1.0.2 is the Bundle Identifier. If you specify a wildcard bundle identifier when creating the App ID, you will need to replace "*" with an explicit string, for example, com.abcexample.app1 or com.abcexample.1 etc. Step 2: Check that the App ID in the keychainaccessgroups.plist file is correct and is the same as the App ID in the provisioning profile. If the App ID in the keychainaccessgroups.plist file is incorrect, you can input the correct App ID, then click the menu Product -> Clean, and then click Product -> Archive to create the IPA file again. Step 3: Copy the Bundle Identifier from the keychainaccessgroups.plist file. Step 4: Click the target project for the app, select the General tab, and then paste to the Bundle Identifier field. By default, the Bundle Identifier on this tab is different from the one in the keychainaccessgroups.plist file. Also make sure the same Bundle Identifier is input when uploading the app to the App Store. If you want to make change to the Bundle Identifier, please make sure the same Bundle Identifier is used consistently in all three areas: the keychainaccessgroups.plist file, the General tab, and the App Store upload process. You now code sign the app with the signing certificate contained in the corresponding provisioning profile. In the Xcode project navigator, select the project, select Building Settings, drag down the screen to find the Code Signing group, make sure Code Signing Entitlements is set to "keychainaccessgroups.plist", then click Release under Code Signing Identity and select the corresponding distribution certificate, and then click Release under Provisioning Profile and select the corresponding provisioning profile. You would need to double check the scheme settings to ensure you do not archive a debug version of the app. Step 1: From the Xcode dropdown menu, choose Product > Scheme > Edit Scheme to open the scheme editor, as shown in the following figure. Modify the archive name or use the default name in the Archive Name field. Step 3: (Optional) Click the project for the app, select the General tab, and then configure the Xcode project for distribution. All the information specified in the Appeon Developer Package tool can be reconfigured here and you can also configure those that are not listed in the Appeon Developer Package tool (only the required information are listed for configuration in the Appeon Developer Package tool). For details about how to configure the settings in Xcode, read Configuring Your Xcode Project for Distribution in the Apple document App Distribution Guide. Now you are ready to create an app archive. 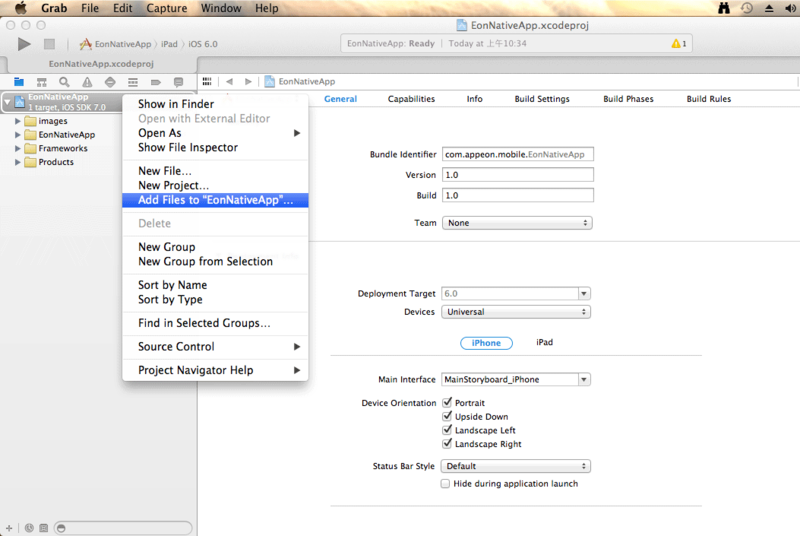 Step 1: In the Xcode project editor, select the project. 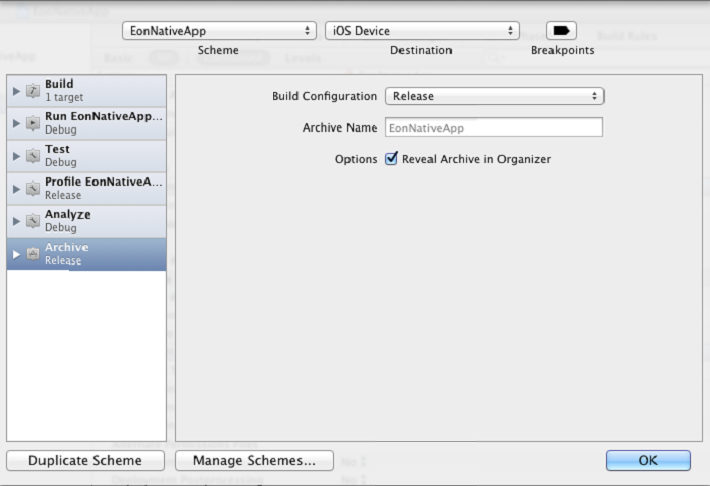 Step 2: From the Xcode dropdown menu, choose Product > Archive. If a prompt appears asking whether code sign can sign the app using a key in your keychain, click Allow or Always Allow. After the project is built successfully, it will appear in the Archives Organizer, as shown below. Now the app archive is ready. You can submit the archive to the Apple App Store or save the file for enterprise or Ad-Hoc distribution. MobiLink supports the encrypted transmission of the synchronous data stream by using HTTPS. If you want to use HTTPS for the encrypted transmission of the synchronous data stream, you should add the certificate file into the project. The following steps take EonNativeApp as an example. 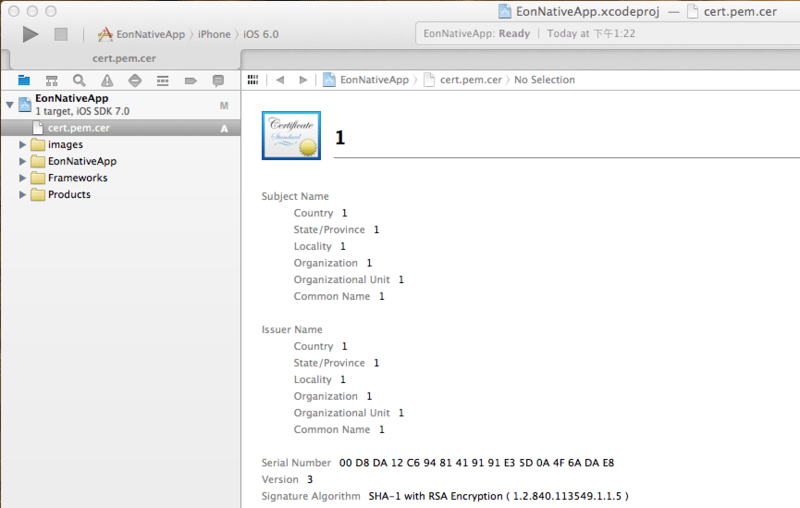 Right click EonNativeApp and select Add Files to "EonNativeApp..." to choose the certificate file, as shown in the following figure. Figure 52. Add files to "EonNativeApp"
In this example, choose the cer.pem.cer file. 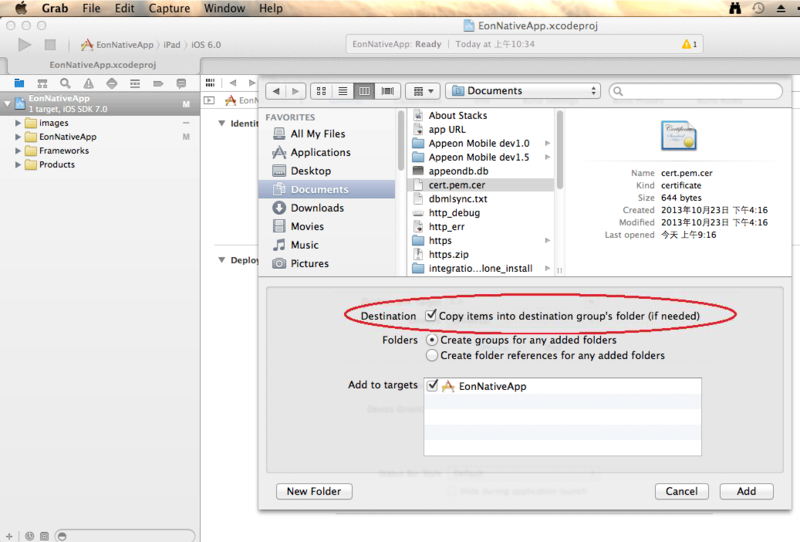 Make sure to select the Copy items into destination group's folder (if needed) checkbox, as shown in the following figure. Click Add. The certificate file is added successfully and is placed in the position parallel to other folders under the EonNativeApp directory, as shown in the following figure. Figure 54. The certificate file is added successfully.